A sumptuous and ravishing yet luxurious and refined masseria. Masseria Curti Vecchi has been beautifully, painstakingly restored to create a subtly luxurious ambience that combines the simple warmth of the original stone walls and the cosmopolitan elegance and exquisite taste of the owner. The effect of softly-spoken splendor continues outside, with fragrant gardens, centuries-old olive trees, shady lounging pergolas and an unassumingly cool pool. Pool open from beginning of April to end of October. Inside: Masseria Curti Vecchi comprises a series of beautifully refurbished stone houses arranged around a central walled courtyard. The main entrance takes one into the hallway, whose vaulted ceilings, immaculate masonry work and timeless antique furnishings set the tone for the rest of the house. To one side of the hallway, a doorway leads into the stylishly furnished living room with original fireplace and wide glazed doors accessing the internal courtyard. The living room leads in turn to the extremely convivial dining area, which is served seamlessly by one of the best-equipped and spacious kitchens in our portfolio. More glass doors take one out of the kitchen to a shady terrace with al fresco dining area and barbecue overlooking the lawned courtyard. To the other side of the entrance hall, an opening leads into the master suite, comprising a twin bedroom (suitable for children whose parents are staying in the master bedroom), a large master bedroom with double bed, and a sumptuous en-suite bathroom with double sinks, designer tub and separate walk-in shower. Any children staying in the adjoining twin bedroom would share the bathroom accessed through the master bedroom. From the central courtyard, one accesses three more bedrooms, two doubles and a twin-double. Each of these bedrooms has its own luxurious en-suite bathroom with walk-in shower. Please note these rooms do not communicate directly with the main house, nor with each other. Last, but not least, is the Zigguratesque wine cellar, home to a superb selection of wines. Furnishings and fittings throughout are of the highest quality. Outside: accommodation at Masseria Curti Vecchi flows out into a beautifully proportioned courtyard garden featuring manicured lawns, Mediterranean shrubs, blooming flowers and venerable olive trees. The gentle honey hues of the masseria's stone walls provide a soft backdrop for the vibrant colours of the garden and the cerulean sky above. To one side is a shady outdoor living area, to the other a gorgeous al fresco dining area, conveniently served by the kitchen and a barbecue. Paths criss-cross and orbit the lawns, leading down to a gate and a second section of garden. Here, a voluminous, comfortably-furnished pergola surveys a large expanse of emerald lawn planted with a few high-swaying palms and equipped with a volleyball net. At the centre, very much in pride of place, is the stunning 20-metre-long pool, served by another shady pergola. Views pan out over whispering olive groves and the tranquil surrounding countryside. The master suite's double bedroom is accessed via a twin bedroom. The en-suite bathroom of the master suite, which would be used by anyone staying in the twin, is accessed via the double bedroom, meaning that the occupant(s) of the twin bedroom would have to go through the double bedroom to get to the bathroom. For this reason we recommend that the twin bedroom is only used by children whose parents are staying in the suite. The largest courtyard bedroom may, on request and for a small extra payment, be equipped with an extra single bed. Masseria Curti Vecchi is set near the charming village of Specchia. The baroque centre of Specchia has been largely restored to a very high level, and has attracted a good selection of bars and restaurants serving high quality Puglian fare. Masseria Curti Vecchi is also a few minutes' drive from the three charming villages of Taurisano, Miggiano and Ruffano, complete with a restored baroque centres and a selection of bars, restaurants and shops. The nearest sandy beaches, some of the most beautiful anywhere in Italy, are near Ugento and Pescoluse on the Ionian coast, about half an hour's drive away. Also an easy drive away are the charming villages of Leuca, Tricase and Castro Marina. Lovers of culture will not want to miss a visit to the stunning baroque jewel of Lecce, the dramatic walled island of Gallipoli, or the defensive city of Otranto, all of which are within very comfortable "day-trip" distance. "This is my second visit to Masseria Curti Vecchi. The villa is amazing and the pool is to die for. The landscaping is also very professional. The staff are fantastic. Nothing is a problem." This is my second visit to Masseria Curti Vecchi. The villa is amazing and the pool is to die for. The landscaping is also very professional. The staff were the same as our first visit. They are fantastic and treated us as if we were family. Nothing is a problem. 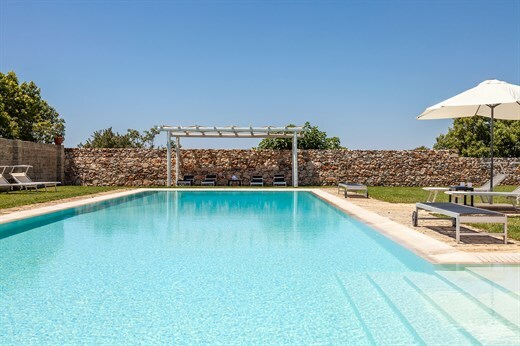 Masseria Curti Vecchi is a lovely house with a gorgeous pool. Having wine in the wine fridge was great. Good wifi. The staff were all charming and very helpful. Delicious food too. The cooks and caretaker deserve special praise as they were very accommodating but also very discreet and easy to have around. My daughter felt so at ease with them that she helped making tiramisu so she could learn how to do it! The standard of the meals prepared was really excellent. Masseria Curti Vecchi is fantastic. Amazing 20m pool, high spec kitchen, high end Pioneer TV, wifi plus satellite. Lovely rooms all en suite, all self-contained but adjoining the central courtyard. Lovely outdoor dining area, terrace seating and second shaded terrace adjacent to pool. Lovely villa, nicely appointed, great pool and gardens. The caretaker was lovely and very helpful. Masseria Curti Vecchi was paradise. The staff were totally lovely and helpful. The in-villa cooks were wonderful. Food prepared beautifully. Felt totally luxurious. Masseria Curti Vecchi is probably the nicest villa I have ever seen. It was perfect. The pool was perfect. The staff of the Masseria were excellent and everything exceeded our expectations. Such an amazing holiday. We couldn't have asked for anything more. Masseria Curti Vecchi was in a lovely quiet area. The bikes were really appreciated and it was great being able to cycle to the local village. We enjoyed many nights sitting at the long stone table with our extended family of 9 eating freshly prepared meals. This is a very relaxing place, less touristy, less flashy, enclosed only by olive groves and little nice towns nearby where you can shop at the local fruttivendolo and enjoy an espresso. We loved Masseria Curti Vecchi. All the bedrooms are beautifully planned, decorated and furnished. The swimming pool was amazing and the garden was beautifully laid out, with its different shaded areas and plants. Also the guardian and ladies who came in each day were friendly, charming and really helpful, as well as being wonderful cooks. We could not have stayed in a lovelier house or felt more comfortable and away from it all. We had a wonderful holiday. A truly lovely masseria with high quality fixtures and fittings. We loved it... A perfect villa to relax and enjoy the beautiful pool and surrounding areas... In-villa cooks were excellent, food was fab, and service was cheerful and efficient... A smooth booking and holiday - thank you all. Bestes Housekeeping und fantastische Köchinnen, grossartig!